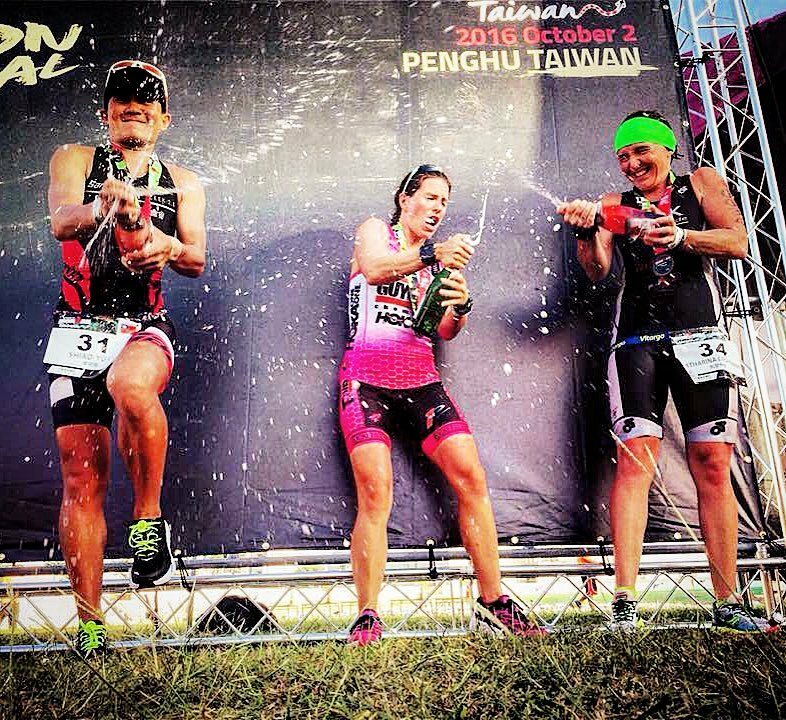 Ironman Taiwan was located on several small islands, which together are known as Pescadores. However, most of the race course was on the island of Penghu in the city of Magong. All the athletes were welcomed into Penghu with open arms. Once Jeff and I arrived we were amazed at the kindness and hospitality we were shown the entire trip. The swim start was located on Shi-Li Beach. It was a beach start, followed by a two-loop swim course with a beach exit and run mid-way through. The women’s professional race started two minutes behind the men’s field. As they were announcing the favorites for both the men and women’s field, one of my fellow competitors Keiko Tanaka pointed to the sky where a beautiful rainbow painted the sky. It was God’s sign that today was going to be a great day! Once the men were off, the professional women were escorted to the starting line (a good old-fashioned line in the sand). 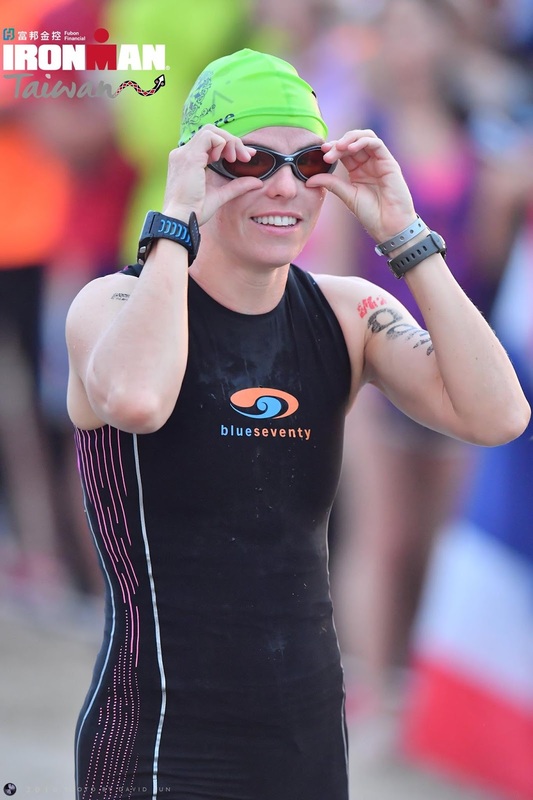 It was a non-wetsuit swim for the professionals so I was outfitted in my Blueseventy Women’s PZ4TX Swimskin, and my Blueseventy Hydra Vision Goggles. Sān, èr, yī… Qù (three, two, one… go) we were off! I tried to sprint to the front to get a good position to enter the water. It was low tide and very mellow surf. This made for a long entry into the water before you could start swimming. I had a great start and was able to get on some faster feet for the first 300 meters of the swim before the two women in front of me started to cruise away. Once I lost sight of their feet I was on my own. The swim course was marked really well with stringed buoys the entire length of the swim. Just like the swim at Ironman Lake Placid if you hugged the chain or, in this case, the stringed buoys you would remain right on course. The first lap went by really fast. Once I exited the water for my beach run between loops, I could see Ali Fitch who was in second place. She was just entering the water for her second lap. I was not that far back. But first place, Keiko, was already back into the ocean swimming her second loop. I dashed into the water to start my second lap. Once I was halfway through my second loop, I started coming up on lots of age-groupers who were still on their first lap. Navigating though the masses allowed me to think about something other then just swimming on my own for almost the entirety of the 3.8km swim. Once I could spot the swim out arch, I could not wait to get onto my bike. I exited the swim in third place with the time of 1:02:52 my best swim placement exit to date! I raced up the beach to T1 and to my bike bag and bike. I had a decent transition and was six minutes behind first and only one minute behind second. I was feeling good and controlled, now was the time to see how the legs were going to respond on the bike. I knew it was going to be an extremely hot day and going a little more conservative on the bike would pay huge dividends on the run. The bike course exited the Shi-Li Elementary School, where the swim took place, and did a (~27km) box before dropping you out on an out-in-back section approximately (~45km) which you did three times totaling to about (~135km), before you made your way towards the stadium for T2 finishing up the remaining (~18km) of the bike. The terrain consisted of some rollers and flat sections, mostly exposed to the sun, heat and wind. I was able to take over the lead around 50km on the bike. This was my first time EVER leading the bike in any of my professional races. Wow, is it fun to be the lead biker! The kilometers ticked by and at one of the turn-a-rounds Jeff was giving me updates that both Shiao-Yu Li and Katharina Grohmann were both making up time on me. This was a true test of patience. The ego in me wanted to push harder on the bike and try to extend my lead but I kept getting reminded of my mantra to: “stay patient, persistent and positive, no matter what”. Stick to the plan, put into place by my coaches, Simon and Lisa Lessing and Darren and Colleen De Reuck (Boulder Coaching). It was also imperative to stay up on my nutrition throughout the entire day. The first half of the bike, I had two bottles filled with 1st Endurance EFS-PRO and one water bottle which I refilled at each of the aid stations. I sipped on EFS Liquid Shot every 30 minutes on the bike and salt when needed. At special needs, I got two fresh bottles of EFS-PRO and EFS Liquid Shot. I was able to hold back more then I am accustomed to for the entire bike and came into T2 with a time of 5:10:55. I had an approximate lead of two and half minutes over Katharina and five minutes over Shio-Yu Li. My Stages Cycling power meter kept me on track the entire bike. Exiting T2 for the marathon run the heat really intensified. The run course started with about 1.5km run before you entered the 2-loop course and then finished up with the 1.5km back to the stadium for the finish line. For my first 2km, I started running at 4:27 pace per kilometer and it became very clear this would not be a sustainable pace. The aid-stations were every 2km on the run, so you had to really take advantage of each aid-station. It was key to stay properly hydrated and ‘up’ on your nutrition. I sipped on EFS Liquid Shot before each aid-station and then I would try to drink as much water as possible and fill my kit with as much ice as I could to try to keep my body temperature down for at least the next half kilometer. It took about 4km into the run before I started getting into a routine at each aid-station, and a manageable pace on the run. I was so thankful to have my Hoka One One Clifton 3’s for extra cushion. At the run turn-a-around, Jeff updated me that my lead was growing on the run and to ‘keep doing what I was doing’ which was taking my sweet ol’ time at each aid-station, cooling off and then trying to get into a manageable running pace to get to the next aid-station as quickly as possible without overheating. The volunteers at all the aid-stations were wonderful and eager to help in anyway. By the last turn-a-round it was clear that if I kept the same pace I would win my third Ironman title. I could not wait to get into the stadium! With the last 1.5km back to the stadium I started to feel my zoning domineer switch to one of sheer joy and excitement. Once I arrived at the stadium, I had a flight of stairs to descend before making my way onto the field and down the finisher chute to the finish line! I had a marathon time of 3:31:32, fastest female run split, and an overall time of 9:50:03, placing me 11th amongst the men! 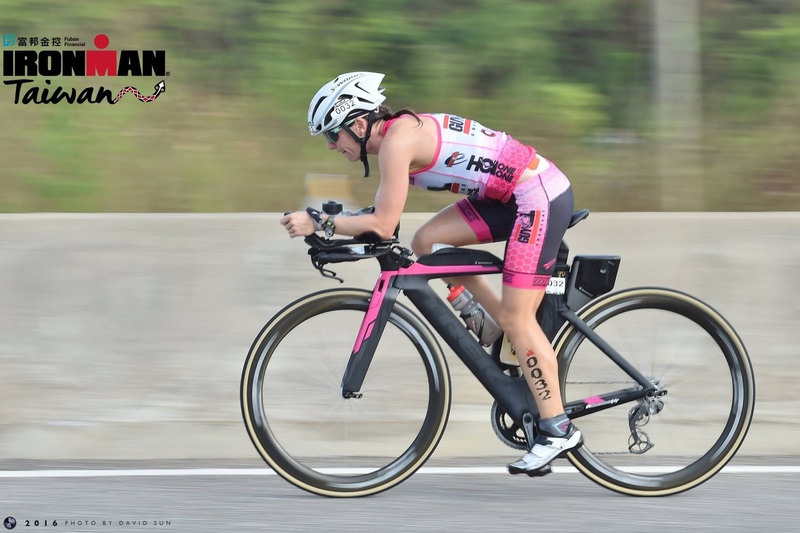 There were many personal moments that I could feel God’s presence on both the bike and run. As if he was saying to me, “Just keep doing what you are doing, and you will have a very successful race!” I came into this race very hungry to finally be competing again. I had worked extremely hard to regain my health and strength. After a year of overcoming what doctor’s thought could be a career ending sickness, I could not ask for a better comeback race! To cross the finish line holding up the finisher tape was additional confirmation to me that when you do the right things and stay patient, persistent and positive you can overcome the greatest of obstacles. Don’t let someone tell you, you cannot do something! Always believe in yourself AND your dreams! This journey would not be possible without the love of my life, best friend, soul mate and greatest supporter, Jeff Mack. 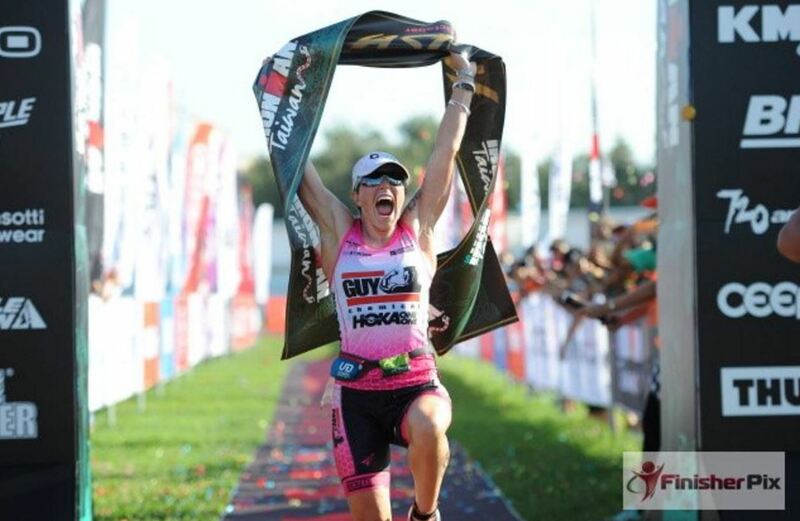 I feel so blessed that God has helped me to recover and do the thing that brings me so much joy, race Ironman again! This race was dedicated to Guy Chemical who has shown me so much support and loyalty throughout this past year of darkness. You truly are the best! 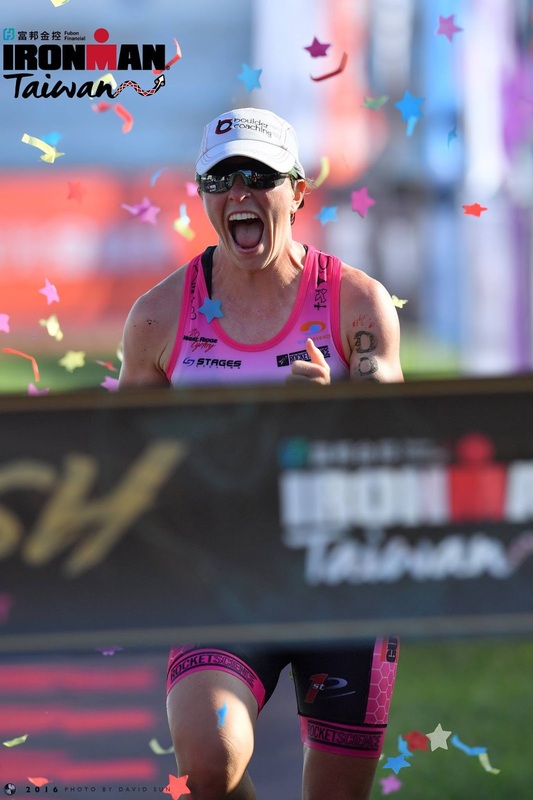 I am beyond grateful to all my phenomenal sponsors for their unwavering support this past year: Guy Chemical, Hoka One One, First Endurance, Boulder Coaching, blueseventy, Wheat Ridge Cyclery, Stages Cycling, Transformation Massage, Pro Bike Express and Turley’s Kitchen. Thank you so much to my parents, family, coaches, friends, training partners and fans. Your words of encouragement and support goes way further then you can imagine. I want to especially thank, Kelly Ryan, who has been the best training partner anyone could ask for! Thank you to all the volunteers who came out in excruciating heat so we could have a fantastic race! You are our Earth Angels! Thank you to Renny Ling, Ironman Taiwan’s Race Director who put on an outstanding race and Shiang Wei Tsao the professional athlete coordinator. I want to extend a huge thank you to all my female competitors. You are all very tough and I hope to race each of you again soon! I am so looking forward to my next race!